Strengthened by the whole armor of God, Bibleman battles the powers of darkness with his laser Sword of the Spirit in his hand and faithful cohorts, Biblegirl and Cypher, at his side.& ; Packed full of explosive action, vile villains, catchy songs, and, of course, Scripture, Bible is eye-popping entertainment for the whole family. 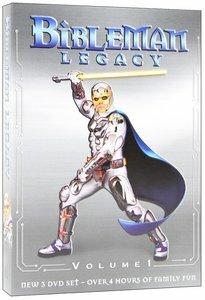 This exclusive 3-disc collector's set brings the best of Bible in one deluxe DVD box set featuring over four hours of exciting, family entertainement.& ; Loaded with DVD exclusives and extras, bible Legacy is a must have for Bibleman fans and the perfect introduction to a hero worth following. Strengthened by the whole armor of God, Bibleman battles the powers of darkness with his laser Sword of the Spirit in his hand and faithful cohorts, Biblegirl and Cypher, at his side. Packed full of explosive action, vile villains, catchy songs, and, of course, Scripture, Bible is eye-popping entertainment for the whole family. This exclusive 3-disc collector's set brings the best of Bible in one deluxe DVD box set featuring over four hours of exciting, family entertainement. Loaded with DVD exclusives and extras, bible Legacy is a must have for Bibleman fans and the perfect introduction to a hero worth following. About "Legacy Volume 1 (3 DVD Set) (Bibleman Genesis Series)"